Bring 5 quarts salted water to a boil over high heat, add the pasta, and stir to prevent sticking. Cook according to package directions. 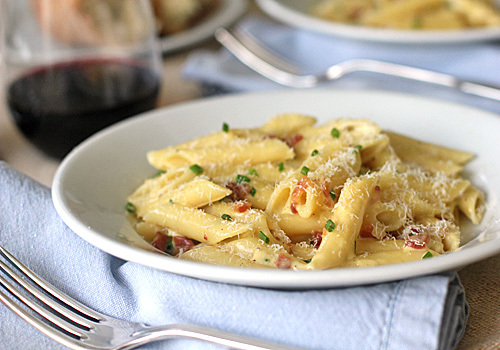 While the pasta cooks, saute the pancetta in a non-stick skillet until browned and crisp. Using a slotted spoon, remove the pancetta to a paper towel to drain. In another saucepan large enough to hold the pasta, combine the cream, egg yolk, and mustard. Bring to a simmer and whisk to blend. Season with salt and pepper. Drain the pasta well and immediately add to the cream sauce. Toss to coat the pasta with the cream sauce; let rest for 1-2 minutes. Add the cooked pancetta and chives; stir to combine. Taste for seasoning and transfer to warm plates. Garnish with the Parmigianno-Reggiano and serve immediately. 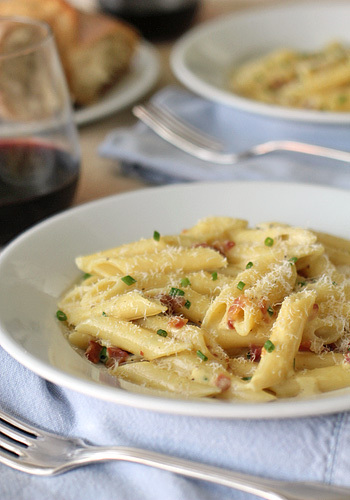 I know I am hating the cold but this dish looks like perfect comfort food!